Whatever your business, it can, and does, create a carbon footprint as a result of that enterprise. Regardless of how big or small of an organization you have, the activities of that organization will create greenhouse emissions because of the energy expended and the products/raw materials consumed in manufacture or services. One of the things that increase your carbon footprint is the amount of printing you do in the office – circulars, memos, newsletters, correspondence, bills, invoices, records, legal documents – the list goes on. It isn't just the paper you use – you are probably socially and environmentally aware enough to print only what is really required. But, what about ink cartridges? Do you know how much it costs the earth for each cartridge to be made? The plastic raw material, the ink and the packaging material, to say nothing of the energy consumed in manufacturing that one cartridge is very considerable. Also, have you given a thought to discarded cartridges – where do they end up when they are exhausted? Well typically, you toss that empty ink cartridge into the trash after you're done with it. Via your garbage it reaches the landfill and stays there for a really, really long time, in the meanwhile polluting soil as well as waterways. An estimated 350 million used ink cartridges end up in landfills every year – this is a staggering amount. And here’s something else that is staggering: it will probably take a thousand years for that cartridge to decompose! Is this the only thing you can do with a used cartridge? Can you do anything to make your printing more environmentally friendly? It is thought that more than 70% of all used ink cartridges are simply thrown away, without a thought to where they go and what will happen to them. However, you can help to make a difference. Instead of tossing the used cartridges into your garbage, you can recycle them. 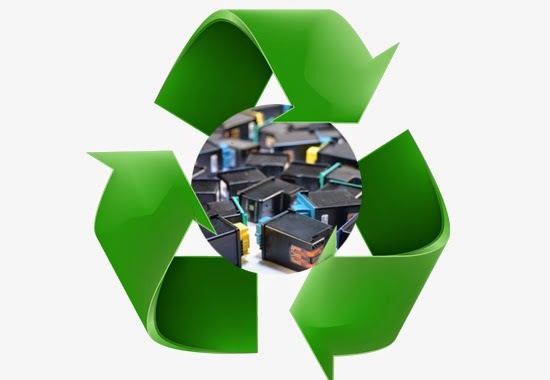 Many manufacturers offer recycling facilities – all you have to do is drop off the used cartridges at specified locations or ship them to the specified address. Another option is to buy re-manufactured ink cartridges (learn more about environment friendly ink cartridges). It is possible to reuse one cartridge 2 to 3 times by refilling it. This can help to keep several pounds of waste out of landfills each time you use a re-manufactured ink cartridge and will also help save a significant amount of energy and oil. This can, in the end, help to make your business more environmentally friendly. This helps lower your carbon foot print and helps you make that little extra effort to make your business greener and more sustainable. This is beneficial to your community and to the environment because your business is contributing much less to environment pollution. Plus you have the satisfaction of knowing that you worked towards fulfilling your corporate social responsibility at least to some extent. Find out more about our eco-friendly ink & toner cartridges by liking us on Facebook and subscribing to our mailing list.